The Appalachian Trail begins west of our vineyards and continues on for 2,175 miles before it ends at Mount Katahdin in Maine. Once as tall as the Alps and the Rockies, the Appalachian Mountains are around 480 million years old and were a formidable barrier of ridges and peaks to early settlers heading west. Our vineyard is in a valley near one of these ancient peaks, Glassy Mountain (3,145 ft. elevation). At the base of Glassy Mountain, water trickles from the ground and gradually forms Stonewall Creek. We named our new venture after that meandering stream on our eastern border. 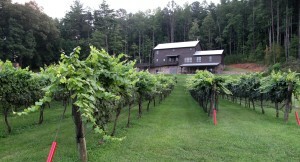 One of the highest vineyards in North Georgia, Stonewall Creek Vineyards has an elevation of 2,200 feet. Morning fog rolls out of the Chattahoochee National Forest and follows Stonewall Creek to our vineyards. Heavy fog and our vineyards disappear. Our soil is a mix of decayed granite and mica, eroded over millions of years from Glassy Mountain, and clay loam. On a sunny day, Mica shards sparkle like diamonds in freshly turned soil and outcroppings on Glassy Mountain shine like glass. Our grapevines dig deep into the earth looking for nutrients, or as Carl says, “the goodies.” At the end of a hot summer day, cool air creeps in from the west. Winter winds are aggressive and rush through our valley while the vines “sleep.” Our county in the northeast corner of Georgia easily wins for the state’s most rainfall. This is our terroir. We planted our first grapevines, a half-acre of Malbec, in May 2005. For the next four years, we added an acre or more of vines each year, experimenting with different varieties, clones and rootstock. Some 3,000 vines now grow on what was once a tired, old apple orchard and pasture. To clear the apple orchard, we attached our tractor and pulled the trees out in early spring, while the ground was soft. After Malbec, we planted more European Vitis Vinifera—Cabernet Sauvignon, Petit Verdot, Cabernet Franc, Petit Manseng, Tannat and more Malbec. Malbec is temperamental and requires constant attention. Cabernet Franc loves our mountains, producing beautiful and bountiful harvests. Petit Manseng is also easier to grow; especially in the higher vineyard that once held apple trees. We have a constant fight with mildew, both Downy and Powdery, and Petit Verdot, Tannat and Cabernet Sauvignon are the most prone. Our first three harvests were from especially warm summers and our Cabernet Sauvignon ripened to lush grapes. The cooler summers with shorter growing seasons since then have produced Cabernet Sauvignon grapes that blend well with a rosé. We’re leasing land off Bridge Creek Road, as you turn into our vineyards, for an acre of Traminette vines, a Gewürztraminer hybrid that originated in today’s Alsace region in France. With Rabun County’s abundant rainfall, we use no irrigation. We do work at mitigating our overly generous amount of rain and have introduced French drains to facilitate water runoff and planted grass between the rows and cover crops to compete with the vines for water. Recent effects of El Niño have added to our constant challenges with Downy and Powdery Mildews. For additional sun exposure, we planted the vines in rows along the contour of the land, work on canopy management by pulling leaves and hedging and use a trellis system that allows more sun. Harvest time is September and October, which thankfully are the driest months of the year. Our vineyards are purposefully low production.We believe this delivers better grape quality. 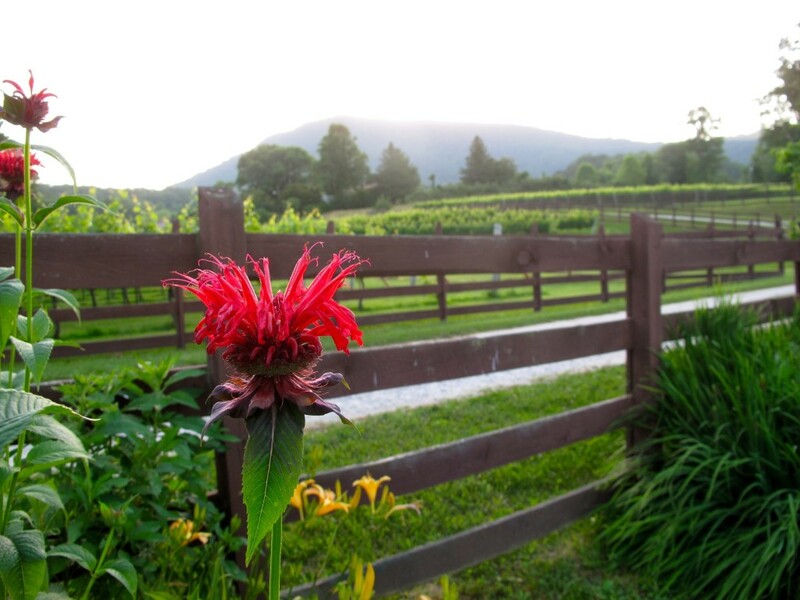 At an elevation of 2,200 feet, we have one of the highest vineyards in Georgia. We experience warm days and cool nights during the growing season. As with many of the vineyards in Europe, ours are considered “cool climate” vineyards. We use no artificial fertilizer and minimal pesticides. 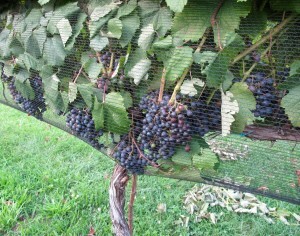 Our biggest pest issue is bird damage, which we reduce with side nets during veraison or grape ripening. We maintain deer wires above our fences, which work with whitetail deer but won’t keep out a black bear. So far, the latter have found enough berries and vegetation to keep them satisfied. The vines rest on a VSP (vertical shoot position) arbor to maximize sunlight penetration and ventilation, both important in our fight with mildew. 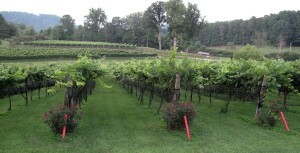 Our vineyards are purposefully low production, generally one ton or less per acre. We believe this delivers better grape quality. There is always work to do. In the summer, we are busy with shoot positioning and thinning, green harvesting, leaf pulling and hedging to keep the vines in balance. Fall is harvest time, and winter is focused on pruning. Late spring frosts can still do significant damage to the fruiting buds and can be discouraging. Nevertheless, in the spring we always look forward to a new and better crop. Being farmers keeps us humble. There is always work to do.Being farmers keeps us humble.